Small Animal Talk: The root of all evil, and why dental xrays are really very useful. 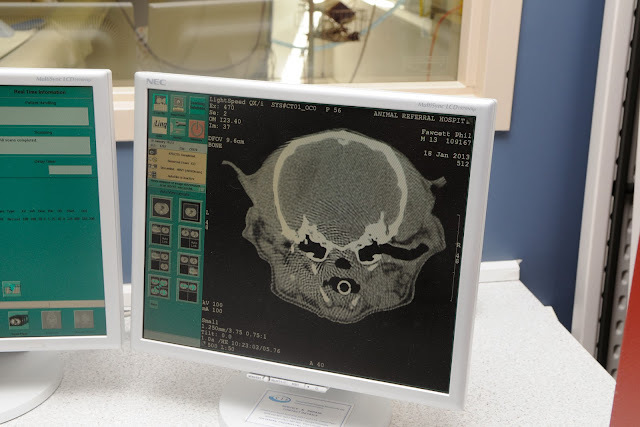 The root of all evil, and why dental xrays are really very useful. Phil's health issues all seem to surround his problem teeth. Here he is relaxing prior to his final (we hope) dental procedure. SAT readers will be familiar with Phil’s colourful history of periodontal disease (if not, you might want to read about it here). 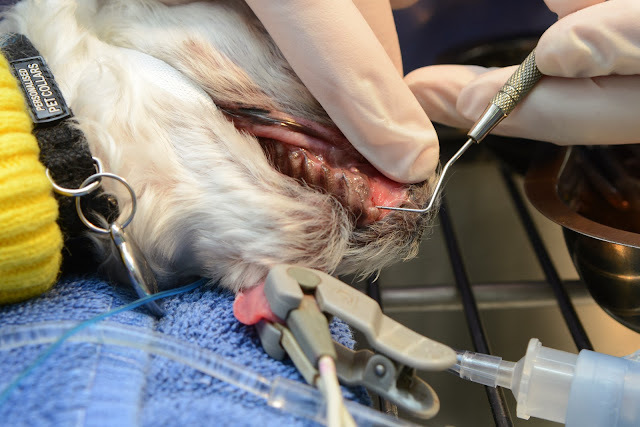 As a rescue dog I can’t take credit for his oral care in the formative years (and I'm not sure I'd want to), but as a microdog he was already at risk of developing periodontal disease. For some time he’s been cruising along with two teeth (his lower canines). 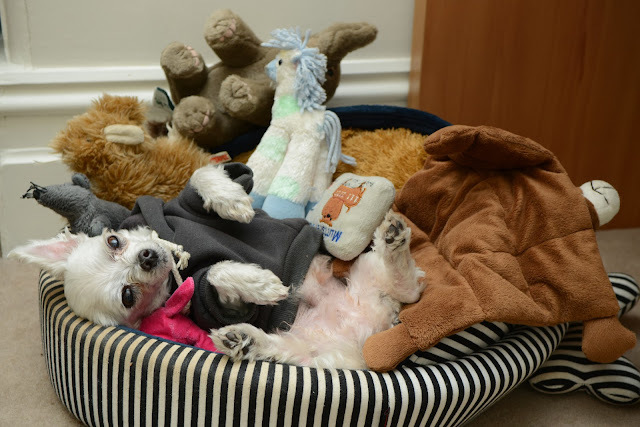 But a few weeks ago he shook his head (as he is want to do sometimes) and in doing so threw himself about six inches (at 2kg there is not much weight to hold him down) – hitting my foot with the side of his face. No, I didn’t kick him. It was one of those freak accidents. He yelped, I grabbed him and he seemed okay but wouldn’t let me examine his mouth. The next day the halitosis set in. I assumed he must have fractured his tooth or developed an abscess secondary to trauma. Trouble is, no one, and I mean NO ONE, could look in that mouth. I was prepared to refer him for root canal treatment to save his last two teeth, but when I anaesthetised him to examine his mouth properly it was bad news. His little gums peeled right away, exposing wells of pus. Dental radiographs revealed severe lysis and osteomyelitis of the jaw. Which looked like this. Radiograph of Phil's mandibular canines. Those in the know will note the marked bone resorption, lysis and periapical abscesses (see the dark halos esp around the lower root in the pic). 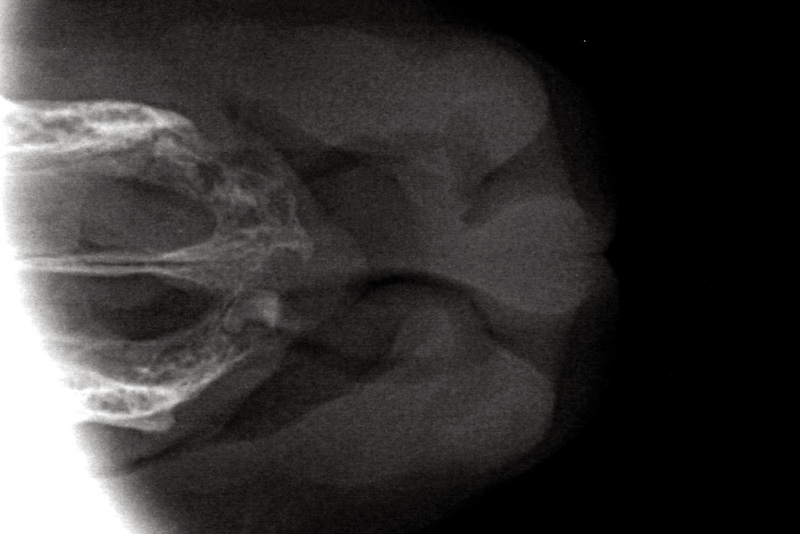 To those not in the know - essentially, there should be a lot more white (bone) in this x-ray. This kind of x-ray makes your heart sink. There was no option but to extract those teeth – without fracturing the mandible. It was a delicate procedure, but with major assistance of my wonderful colleague May (in fact I mostly wrung my hands whilst May worked away patiently at those teeth) and the moral support of veterinary dentist Christine Hawke on the phone, the offending canines were gently coaxed from their attachments. My focus was entirely on those mandibular canines, but whilst Phil was in recovery I checked out an image I'd taken of his maxilla (upper jaw). And there was a retained tooth root, mocking me. This xray also made my heart sink. Can you spot the retained root? Clue: it is on his right hand side (the lower part of the photo) and looks curved. Once you see it you can't unsee it - it stands out like a neon sign, or, if you are into art/propaganda, it looks like this lady's fist. (If you can't see it, scroll down a bit - there's an arrow in the next pic). You see, I had known it was there for some time. Phil has had an issue with recurrent unilateral (one-sided) nasal discharge which I'd done a full work up on, including CT, earlier this year. It started after an insect sting last year, and since then he was producing nasal discharge in spectacular volumes. I flushed his nares, hoping to dislodge a nasal foreign body such as a grass seed or leaf, to no avail. Radiographs at the time did not seem to reveal any lysis. Antibiotics resulted in limited improvement. Steroids did nothing. He would have periods without nasal discharge then shoot out mucus like a kid spraying silly string. On one memorable occasion he produced a mucus cord so long it circumnavigated his entire muzzle (and I had the camera handy). Phil's legendary "monster booger". I make light of it now, but I was deeply concerned for his health. Fearing a nasal mass of the sinister variety, I took him to CT and he had a nasal biopsy. 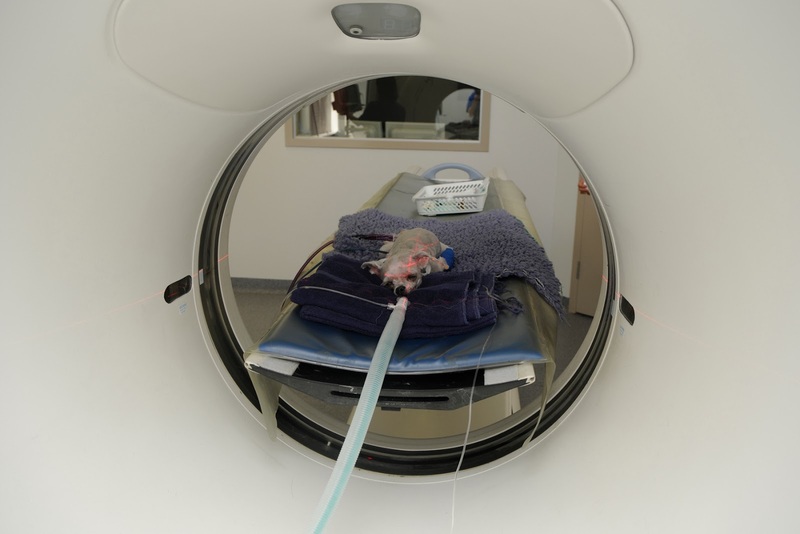 Phil undergoes a CT scan (under general anaesthesia). Phil's CT scan. I don't read these things for a living, but my initial clinical impression was "there's an alien in there". (Seriously, it looks like it has really ornate eyebrows and might be smoking a hollow cigar). At the time it was noted that there was a retained right maxillary incisor root, but the working diagnosis was non-neoplastic rhinitis (the biopsy confirmed "lymphocytic plasmacytic rhinitis", cause undetermined). I was relieved it wasn't cancer, but his ongoing signs caused both of us stress. So when I noted the marked asymmetry of the rostral maxilla on the recent xrays, I grew convinced that that little hook might well be the root of all evil. It wasn't clear cut and there was much debate. Some colleagues told me it was very likely to be the cause of his rhinitis, others said nope, it wasn't associated with a periapical abscess (you can trace the periodontal ligament). There was vigorous debate. But if you've ever had an ingrown toenail (I did once and I was grade 4 lame (I have a photo but some things aren't meant to be blogged)) you'll know that a tiny foreign body can cause disproportionate inflammation, irritation and pain. Its the "princess and the pea" all over again. So, even though Phil is technically toothless, Dr Hawke and I went in to find that root (I know, when I read that I have flashbacks from "Inner Space" - it wasn't quite that exciting). And it was there waiting for us. There was a tiny fistula which accommodated the dental probe. This lead to a little stream of pus, in which was floating a tiny piece of bone that Dr Hawke deftly flicked out. We stared at it long and hard. Was this insignificant shard really the source of Phil's woes? The probe slides into a fistula adjacent to the maxillary incisor root. On repeat radiographs it was evident that there was significant bony involvement. Flushing of the fistula proved that it communicated with his nasal cavity: saline went into the hole and came out of his right nostril - the hallmark of an oronasal fistula. 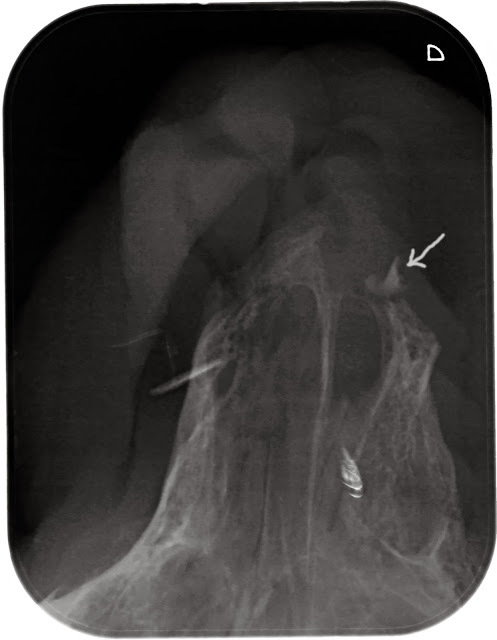 You can see the root (arrow) surrounded by a well of darkness (bone resorption/osteomyelitis). There are some artefacts on this image, but the important thing is the hook-shaped root. See - its not there now! I didn't want to recover Phil prematurely and leave any part of the offending root behind, so we took a repeat radiograph to confirm its absence. 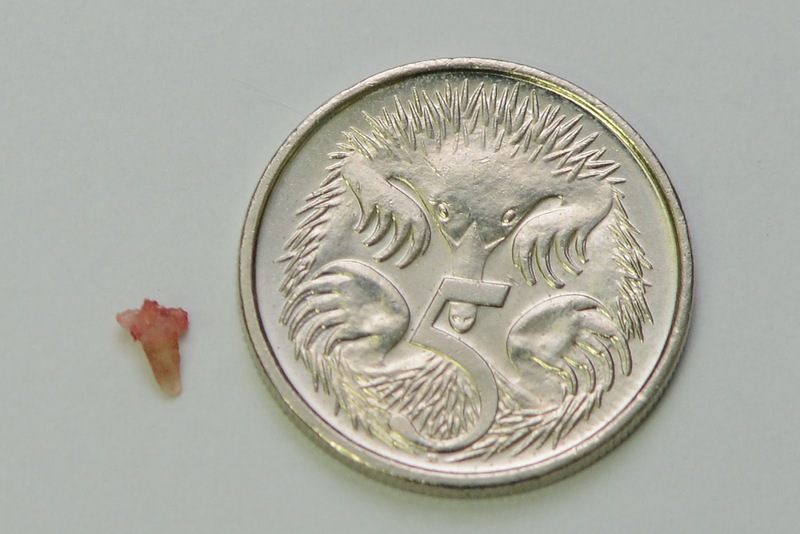 Retained tooth root beside 5 cent piece for scale. There you have it. Is this definitely the root of all evil? Time will tell. Naturally Phil is snorting a little bit and he produced another legendary "monster booger" tonight - but that's to be expected given the extensive curettage and lavage of the affected region. I expect the signs will resolve in coming weeks, but I will keep you posted (I can say as I type this he is dancing on the carpet having eaten three bowls of food). How come it read like an incidental finding on the CT report? Maybe the lysis wasn't as bad at the time of CT? And as May said, this is a very small patient. 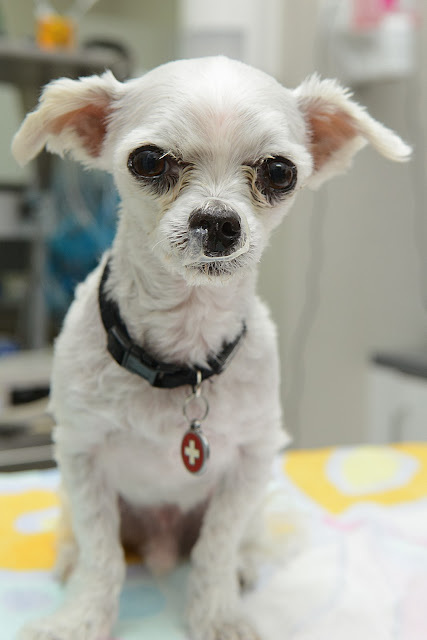 Its so easy for a dog this size to develop a miniscule oronasal fistula. 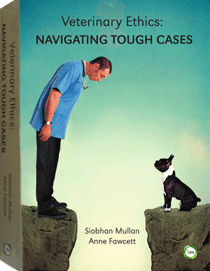 Why didn't I do dental radiographs earlier? Well, I was attached to the allergic rhinitis hypothesis and my mind had omitted the tooth root infection hypothesis when the CT came back. After all, the onset of clinical signs coincided with an insect sting, which in retrospect was a bum steer (maybe the associated inflammation upset an otherwise dormant root fragment?). The other thing was that the signs would subside and he would be sniffle free for extended periods of time. I wondered about intermittent exposure to some unknown allergen. The CT didn't say the tooth root was NOT a problem. I was happy to be reassured by colleagues who said "no, that isn't it" as I wasn't keen to go digging. 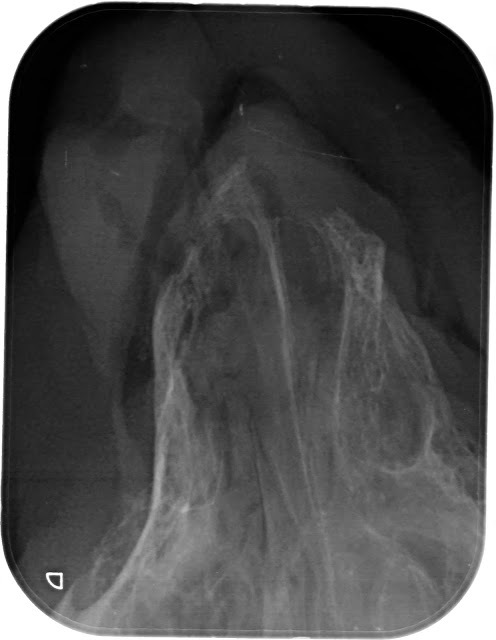 I am certain that serial radiographs would have indicated progression of osteomyelitis in the vicinity of the root. I am glad for Phil's sake that we got there in the end. It might be a tiny piece of bone, but it was very satisfying sealing it up in a jar where it can't cause any more discomfort. Hurrah! [If you want to read more about how attachment to a diagnosis can affect medical judgement, I highly recommend Jerome Groopman's How Doctors Think].